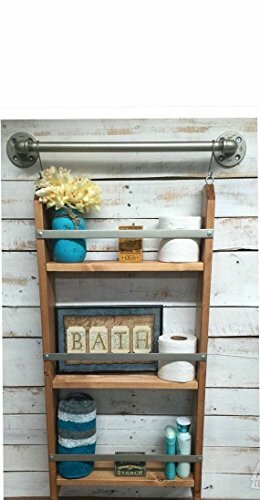 Presenting a unique wooden wall shelf for your bathroom that is sure to tidy up your home. This wood and metal wall decor ladder shelf will keep you organized. This cute piece of home decor is perfect accent to your bathroom. The shelf area features a metal rail that keeps stored items from falling. This multi purpose ladder shelf are sure to get loads of praise from your visitors, so wait no more and get one now. Hardware is included to make installation quick and easy. ► Materials-pipes, fittings, wood, and paint. ►►► Metal Pipe has been thoroughly cleaned to remove any oil residue from manufacturing and painted black or nickel and sealed. This item will ship with mounting hardware. ►►►Wood has been sanded smooth, stained with a beautiful Early American finish and then coated with a glaze to protect the wood. ►►►Hanging Hardware: We will provide the screws for mounting. Wood has been sanded smooth, stained with a beautiful finish and then coated with a glaze to protect the wood.